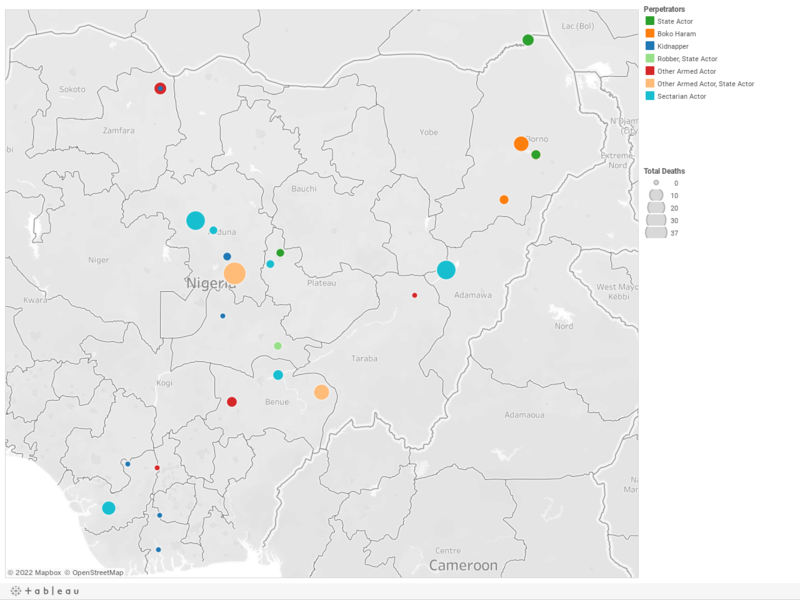 Below is a visualization and description of some of the most significant incidents of political violence in Nigeria from October 20 to October 26, 2018. This update also represents violence related to Boko Haram in Cameroon, Chad, and Niger. These incidents will be included in the Nigeria Security Tracker. October 20: Boko Haram killed twelve in Maiduguri, Borno. October 21: Nigerian troops killed thirteen Gana gang members in Ukum, Benue. October 21: Sectarian violence led to twenty-three deaths in Kaduna South, Kaduna. October 23: Sectarian violence led to "dozens" (estimated at twenty-four) of deaths in Lamurde, Adamawa. October 23: The Nigerian Air Force destroyed a Boko Haram logistics base, killing "several" (estimated at five) militants in Abadam, Borno. October 24: Gunmen kidnapped ten in Akuku-Toru, Rivers. October 26: Gunmen kidnapped five Catholic nuns in Ika South, Delta.